Again I’ve not taken time to write. I always tell myself “Oh I’ll do it before bed or tomorrow first thing in the morning.” And here I am again a month gone by and no post. I need to get work on a weekly schedule. I did so well for a while but now it seems days fly by before I actually sit down and type. It’s not like I’m never on here either. I still check and read other blogs (although its usually a quick glimpse). I look over other post but never take the time to catch up on mine. My goal is to post once a week! Since I’ve been gone I’ve been keeping busy. My mom came to visit for a week and we had our first baseball practice. I’ve tried new recipes and did some spring cleaning. We’ve been able to do yard work and start seeds. So at least my neglect has been for productive reasons. Haha! My mom’s visit was great. She hasn’t been here for a few years and hadn’t seen the kid for almost a year. He was so excited Nana was staying with us! They got to have a night together and the man and I got a night out with friends. She was able to see his first baseball practice. It’s his first year of T-ball and dad is coaching. Over all it was a great visit. Sometimes it’s a little sad that he doesn’t get to have that special bond with her and see her often. But it makes these visits all the more special. Now that the baseball season has started the weekends are going to be busy. All our games and practices are on Saturdays and Sundays. It’s so cute to watch the kids out on the field. They are so excited! I can’t wait to see them all dressed in their uniforms (which I hope to pick up tomorrow). I’m not entirely happy with the set up of the league but watching the kids have so much fun makes up for the rest. With the warm weather sticking around we’ve been able to start cleaning up the yard and getting it ready for cook outs and a garden. I decided to start seed for the garden last week. I have a few that are already sprouting. I’m hoping they all do! This year I’m trying watermelon. The kid really wanted it so we’re giving it a shot. I hope it does well. Fingers crossed! It looks like my beans are sprouting and either my lettuce or spinach. I’m not really sure which. I took photos or my starters and on the 1st I had places a piece of paper so I knew which direction it faced, whoever, on my 2nd I didn’t. My basil and rosemary are doing great. I’m so happy to have the fresh herbs in my kitchen window. It’s so nice to walk over and grab from them while cooking. 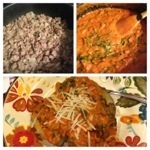 The first recipe I used them in was one I saw on Food Network. It was on Giada At Home. It’s Baked Potato with Sausage and Arugula Sauce It was so good. The recipe doesn’t call for basil but I love it so I added a little. 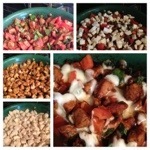 Another favorite or mine has been what I call Chicken Caprese. again the fresh basil was awesome. I can wait to make this with tomatoes from my garden. I also tried a dessert, it’s not pretty but it was yummy! With all this nice weather and mom’s visit and baseball I’ve been struggling to go upstairs and craft. I’ve finished a few pairs of leg warmers today. And I got a pair of bloomers finished for my friends daughter E, but I’ve not made anything else. The bloomers are a little difficult, I need A LOT of work on my sewing technique. I just can’t master the leg openings. E needs a few more bloomers so I’m hoping that practice makes perfect. And to add to all my fun, today I signed up to sale Paparazzi Jewelry. Not sure exactly how well I’ll do with parties or events, I get a little nervous around people i don’t know, but I love jewelry. I can’t wait to see what all is in my kit! Next week will be like Christmas. Previous Yay! Sun! Good-bye Winter! Glad you are back. Blogging is hard when you are living life. Sorry, but my heart breaks to hear your mother and child don’t see each other that often. I have a three year old grandson and I have a hard time only seeing him every few weeks.